In the Previous Post PIVOT and UNPIVOT in Sql Server explained how PIVOT relational operator can be used to transform columns distinct values as Columns in the result set by mentioning all the distinct column values in the PIVOT operators PIVOT columns IN clause. 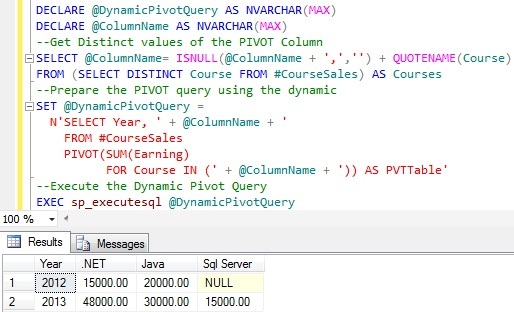 This type of PIVOT query is called Static PIVOT query, because if the PIVOT column in the source table get’s extra unique values after the initial query then that will not reflect in the PIVOT query result unless it is mentioned in the PIVOT Columns IN clause. Static PIVOT queries are fine as long as we know that the PIVOT column values never change, for instance if PIVOT column values are MONTH or Day of the Week or hour of the day etc. In this Article will present how we can write a Dynamic PIVOT query with an example, where we don’t need to mention the PIVOT columns each unique values and no need to worry if PIVOT column gets extra unique values after the initial query. Let us first understand the Static PIVOT query and then see how we can modify this Static PIVOT query to Dynamic. 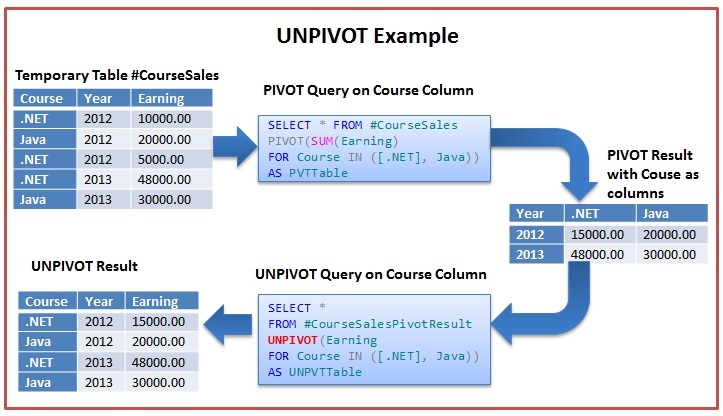 Below Static PIVOT script pivots the #CourseSales Table data so that the Course columns distinct values are transformed as Columns in the result set as depicted in the above image. Let us insert one more row in the #CourseSales table for the new course SQL Server with below insert statement. Now rerun the above PIVOT query. From the above result it is clear that the newly added course Sql Server sales data is not reflected in the result. To make the above Static PIVOT query to dynamic, basically we have to remove the hardcoded PIVOT column names specified in the PIVOT operators PIVOT columns IN clause. Below query demonstrates this. From the above result it is clear that this query is a True Dynamic PIVOT query as it reflected all the courses in the #CourseSales table without needing to write hardcoded course names in the PIVOT query. This article provides introduction to the PIVOT and UNPIVOT relational operators introduced in Sql Server 2005 with extensive list of examples. PIVOT is one of the New relational operator introduced in Sql Server 2005. It provides an easy mechanism in Sql Server to transform rows into columns. 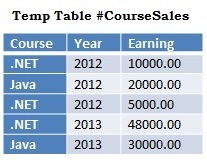 In this example the #CourseSales Table data is Pivoted so that the Course becomes the column headings. Below script pivots the #CourseSales Table data so that the Course columns distinct values are transformed as Columns in the result set as depicted in the above image. In this example the #CourseSales Table data is Pivoted so that the Year becomes the column headings. Below script pivots the #CourseSales Table data so that the Year columns distinct values are transformed as Columns in the result set as depicted in the above image. Transforming Sales Table data to a Quarterly aggregated sales data with Quarters as the Columns in the result set. Let us create a Temporary Sales table and insert 1000 Sample Sales Records With Random past 0-1000 days as the sales date by using the below script. Now we can write a query like below which Pivots the Sales Table Data such that the quarters are the columns in the final result set as depicted in the above image. Transforming Sales Table data to a Monthly aggregated sales data with Months as the Columns in the result set. We can write a PIVOT query like below to get the Monthly Data as depicted in the above image. UNPIVOT is the reversal of the PIVOT operation. It basically provides a mechanism for transforming columns into rows. From the above image it is clear that UNPIVOT is the reversal of the PIVOT operation. But it is not the exact reversal of PIVOT operation as PIVOT operation generates the aggregated result, so UNPIVOT will not be able to split the aggregated result back to the original rows as they were present prior to the PIVOT operation. As depicted in the above image there were 5 rows in the #CourseSales Table Prior to PIVOT, but a PIVOT and it’s reversal UNPIVOT resulted in 4 rows only. The reason for this is for .NET Course in Year 2012 there were two records one with earning 10K and another with earning 5K, the PIVOT and it’s reversal UNPIVOT result last lost this split information and instead of two rows it has generated one row for the .NET course in Year 2012 with Earning as sum of 10K and 5K i.e. 15K. We can use the below script to simulate the PIVOT and UNPIVOT operation as depicted in the above image on the #CourseSales Temporary Table created in the beginning PIVOT section of this article.